During October and November, Marguerite Bride will exhibit at the NUarts Gallery in a show entitled “Beyond the Sea”. Watercolors of seascapes and lighthouses will be the focus of this display, with an educational slant as well; each lighthouse painting has an additional document with the history of the structure. Bride’s fascination with lighthouses goes back quite some time, even before she began painting. Brought up on the water and around boats she was exposed to lighthouses for much of her life. Even now, whenever traveling to a new location, she tries to find new ones to visit. Besides learning the history and some amazing stories about each lighthouse, she now captures these cherished structures in watercolor. This exhibit is a tribute to these respected and cherished buildings — some still operational, others are treasured relics of days gone by. Many are off the coast of New England, Cape Cod and the Islands, others Long Island Sound, the Hudson River and even Lake Gitchi Gumi. Bride is a member of the NUarts Studios and Gallery with a studio at 311 North Street where she paints, gives private lessons and meets with clients and visitors. Visit her website, margebride-paintings.com, to see the full collection of her online portfolio. The artist can be reached by email, margebride@aol.com, or by phone,413-841-1659. 01 Oct	This entry was written by nuartspittsfield and published on October 1, 2013 at 12:22 am. 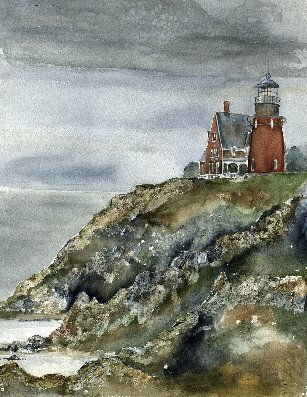 It’s filed under exhibit and tagged lighthouse, marguerite bride, paintings, sea, watercolor. Bookmark the permalink. Follow any comments here with the RSS feed for this post. Newer: small works Holiday Show!